Once again we had an amazing turnout! 300 bikes and over 700 people! IT was a BEAUTIFUL DAY and we are all honored to have your support. We did have so many sponsors that came through at the end and want to make sure we thank them as well!! Once I get the final list I will make sure that I give you all the recognition you deserve! Please feel free to add any and all pictures onto our Facebook page as we love to see the run from your eyes!!! We had 375 bikes with over 600 people in attendance! We are so gracious to all of our supporters to make all of this possible! Thank you from the bottom of all our hearts for your continued support through out the past decade! We love you all so much!! 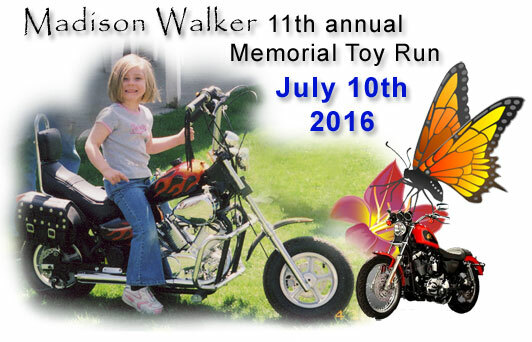 Big Thanks to everyone that came to the 9th Annual Madison Walker Toy Run. It was a great time for all.